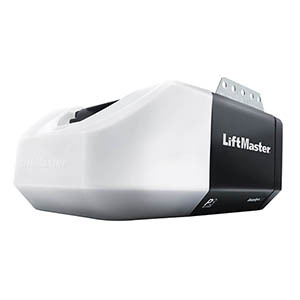 The LiftMaster® 8160W DC Chain Drive Garage Door Opener is rugged and reliable. Updated with the latest features in garage door openers it can connect with MyQ® the free phone app, safeguard garage access by sending a new code with every click, Alert-2-Close signals when a door is being closed by MyQ® and the Protector System®, an invisible light beam that auto-reverses the door if there is an obstruction. The customized DC Motor is purposefully designed and built to last. The Chain Drive system for steady performance and industrial strength. Built with a soft start/stop for smooth operation.